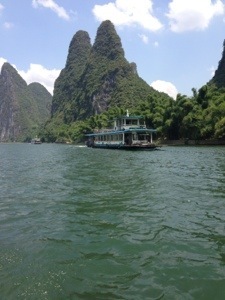 The Li River is the premier attraction of Yangshuo. It is famous throughout China because its scenery appears on the 20RMB note. 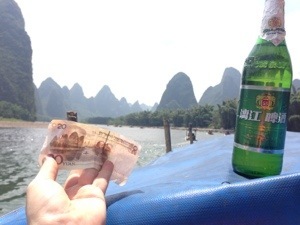 The cliche tourist shot is to hold a 20RMB note as you pass the backdrop on a raft. 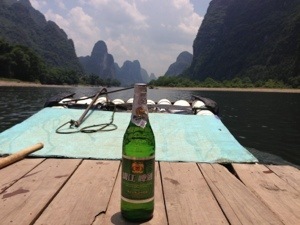 The less cliched shot is to also have a bottle of Li Jiang (Li River) beer in the shot. Even our indefatigable boatman grinned as we set up the shot. 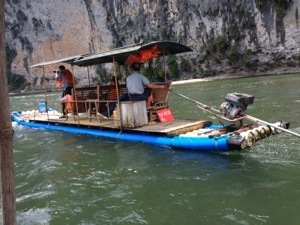 The rafts have changed from the more romantic bamboo variety to the more durable PVC pipe variety. The engines are pretty rudimentary and for awhile I doubted that we’d even start but ultimately it coughed into motion. There’s plenty of options to begin and end, but Xingping is very popular because the village has some ancient streets, where the old style buildings are preserved. We took an hour and a hour to cruise from Yang-Di to Xingping and the cooler air off the water provided respite from the 35 degree heat. Every second off the cruise contains a postcard. The Karsts are simply stunning and often rise sheer for a couple of hundred metres from the shore. A must do experience. It might say something about the movies I don’t watch but Avatar and Star Wars 3 (Ewan Mcgregor one) were filmed on location at the Li River. Do people ever look at you funny when you are taking these outlandishly awesome beer photos? “meester, why you put beer on boat and take peecture?” You are my hero! In short, yes. All part of the fun. Beerp0rn is about titillation. Chinese are particularly amused. I bet the Japanese would nod in agreement to your beer bottle beauty infatuation- they seem to have some of the most ‘open minded’ interests (on the net) that I’ve ever seen. Keep up the good work, Sir, your titillations are greatly appreciated!